A New Jersey bride's "something blue" came in the form of a police rescue after the vehicle carrying the newlyweds and their wedding party got stranded on a flooded road. The Bogota Police Department said officers helped a pair of newlyweds get through their first “rough patch” on Saturday after the bride, groom and their wedding party friends got stuck in fast-rising flood waters during punishing storms over the weekend. Video posted to department's Facebook page shows the officers make the daring rescue. It shows the bride – still wearing her wedding gown – crawling out of the sunroof and sitting on top of a black car that is partially submerged under water. 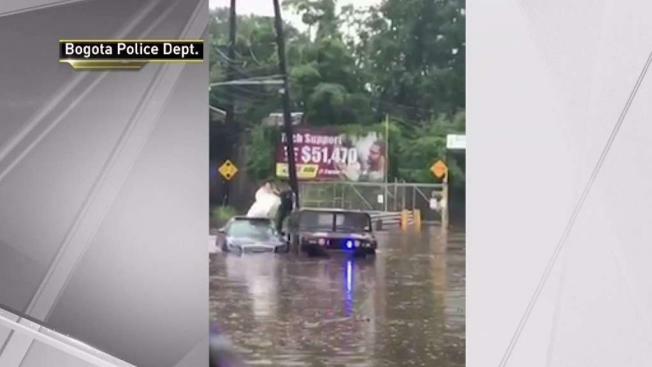 A police Humvee is pulled up next to the flooded vehicle, video shows, and an officer can be seen helping the bride onto the Hummer and into safety. Cleanup continued on Sunday after the weekend’s storms caused extensive damage in New Jersey. Rana Novini reports. “We hope the bride and groom had a great wedding day and we wish nothing but the best for them,” police said in the post. 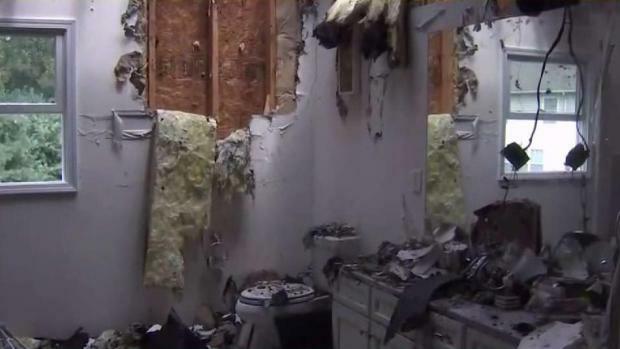 A house in Edison, New Jersey, was struck by lightning and power was knocked out for thousands of people as storms rolled through the tri-state area. Rana Novini reports. 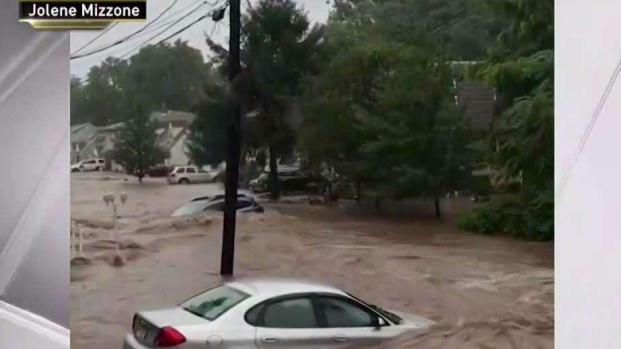 New Jersey was hit especially hard on Saturday with heavy rain and strong storms.